The ExoView™ platform measures 3 color fluorescence on single extracellular vesicles which are bound to the ExoView™ microarray chip. 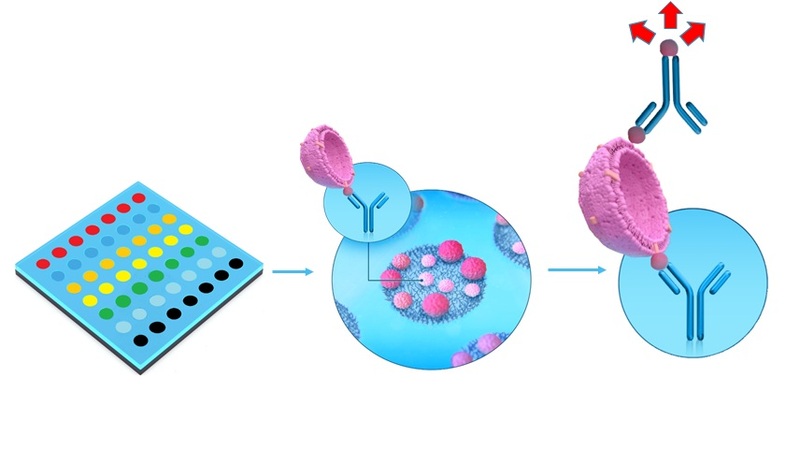 Extracellular vesicles are captured from solution without purification and bound to one of 6 different capture antibodies (plus control) on the surface of the ExoView™ chip. Secondary fluorescent antibodies can be added, and up to 3 colors can be measured simultaneously. The secondary antibodies are common to all 6 capture antibodies. Single binding event sensitivities mean that even poorly expressed proteins on the smallest of extracellular vesicles are detectable through the high sensitivity of ExoView™. Biomarker colocalization allows unique sub-populations of extracellular vesicles to be identified and measured. This image shows vesicles bound to a single anti-CD41a spot on the ExoView™ chip. All vesicles imaged on this spot are therefore positive for CD41a. Once bound, the vesciles have been stained with a 3 color fluorescent cocktail of antibodies against CD63/CD81/CD9. Blue Spots are vesicles that are positive for CD41a + CD63. Green Spots are vesicles that positive for CD41a + CD81. Red Spots are vesicles that are positive for CD41a + CD9. Other colors are vesicles that express various combinations of R/G/B fluorescent signal and CD41a (via capture on surface). All vesicles are simultaneously sized and counted. The ExoView™ platform provides the ability to measure up to 4 markers on a single extracellular vesicles. Once bound to the ExoView™ chip, extracellular vesicles can be permeated and probed for luminal proteins and cargo. 3 color fluorescence allows a combination of staining of 3 surface and/or luminal proteins on single extracellular vesicles. These experiments show the ability to detect luminal proteins such as ALIX and Sytenin through the permeabilization of bound extracellular vesicles.